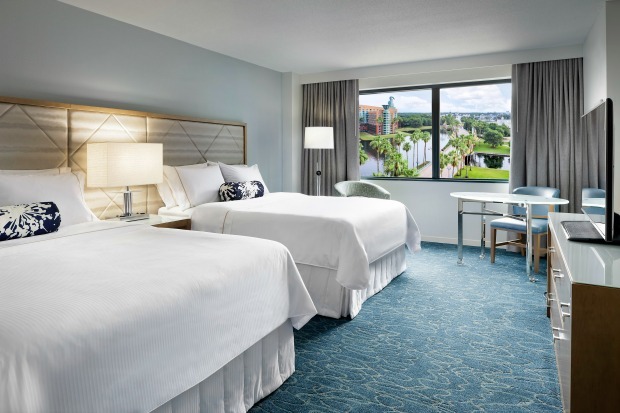 The Walt Disney World Swan and Dolphin Resort has completed the largest transformation in the resort’s history: a $140 million, three-year project which included a redesign of all guest rooms, complete transformation of the Dolphin Resort lobby and renovation of all meeting space. The completion of the project also means the resort returns to operating at full capacity just in time for the openings of Toy Story Land (2018) and Star Wars: Galaxy’s Edge (2019) at Disney’s Hollywood Studios, which is within walking distance of the resort. All 2,267 guest rooms were completely transformed to a new look which reflects the resort’s water-themed architecture. 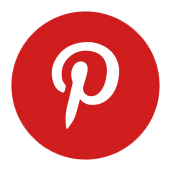 Noted interior design and architecture firm Garcia Stromberg/GS4 Studios designed the rooms, drawing inspiration from the resort’s original designer, the renowned late Michael Graves. 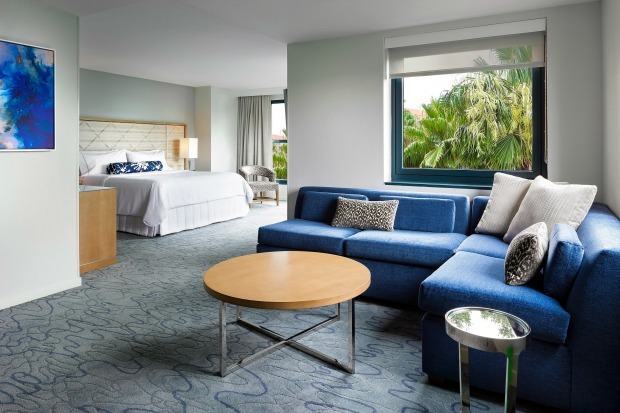 The new rooms offer guests a relaxing oasis featuring hues of white, blue and gray, sleek multi-functional furniture and all new bathrooms featuring vanities with backlit mirrors on iridescent glass tiles. Technology upgrades include the addition of more outlets and USB ports for charging devices and new high-definition TVs. The resort will also soon introduce new interactive TV software, allowing guests the ability to check out from their room and cast their own video streaming services from their personal tablets and mobile devices to their in-room TV. 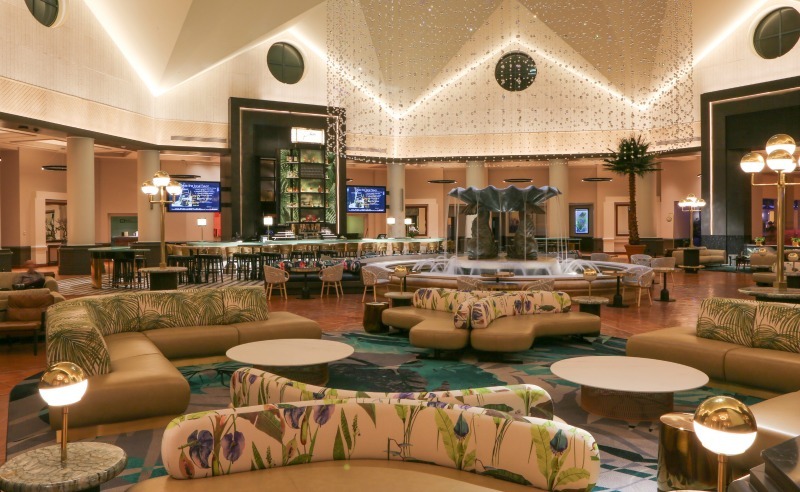 The new Dolphin Resort lobby, designed by ICRAVE, features a contemporary look with a new geometric ceiling, enhanced lighting and more than double the amount of guest seating. 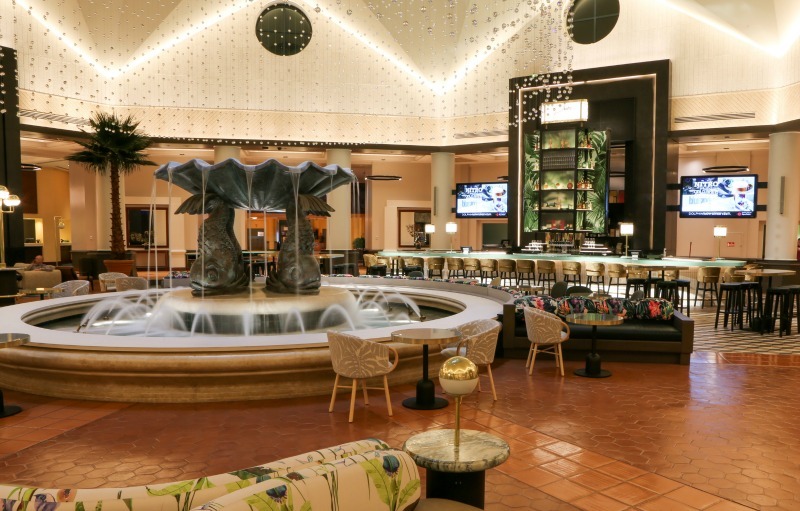 The centerpiece of the new lobby is a grand chandelier stretching 20 feet from the ceiling with nearly 1,000 strands and about 10,000 individual crystals suspended above the Dolphin fountain. For the first time since its opening, the resort has built a completely new dining venue. Located in the Dolphin lobby, fuel offers high-quality quick service and grab-and-go food and drink options for breakfast, lunch, and dinner. Breakfast options include pastries from world-champion pastry chef Laurent Branlard, muffins, breakfast sandwiches and wraps and a variety of coffee, tea, and espresso options. Lunch and dinner options include sandwiches and salads. Those with a sweet tooth will find Branlard’s signature desserts and chocolates as well as frozen yogurt and a wide assortment of candy. Phins, a new bar centrally located in the Dolphin lobby and seating up to 150 guests, offers wines, beers, and cocktails along with appetizers perfect for sharing. Signature offerings include the resort’s own craft brew Phins & Feathers, wine on tap and creative cocktails. On Sunday mornings, Phins offers brunch-themed beverages including a variety of bloody marys and sparkling options. Coming soon will be new private poolside cabanas furnished with lounge seating, tables, fans, refrigerators and television for rental. Each cabana will include full food and beverage service. A new 2,800-square-foot meeting and event space, Lake View, offers scenic outdoor views of the resort’s private lake and picturesque Dolphin Resort. All of the resort’s 332,000 square feet of meeting space has been transformed with an updated appearance. For rates from $169 per night at the Walt Disney World Swan and Dolphin Resort, visit us at Dreams Unlimited Travel!